These are the formative years of a West Coast wave energy industry, and scientists are working with businesses, communities and policymakers to gather environmental data, test new technologies and consider the options. Their work is coordinated through the Northwest National Marine Renewable Energy Center (NNMREC), a partnership between Oregon State University and the University of Washington. Since its establishment in 2008, NNMREC has attracted nearly $20 million in private, state and federal support. The NNMREC wave energy test site is about three nautical miles off Yaquina Head near Newport, Ore.
Just off the coast, not far from OSU’s Hatfield Marine Science Center in Newport, a marine ecologist affiliated with NNMREC has been analyzing life on the seafloor. Working at depths of 60 to more than 400 feet, Sarah Henkel and a student team scoop sand and sediments to examine organisms and physical properties. They conduct beam trawls to gather bottom-dwelling fish. They use a remotely operated vehicle to survey rocky outcrops. Henkel aims to anticipate the biological consequences of ocean wave energy on the Oregon coast. Her work complements studies of gray whale migrations conducted by OSU’s Marine Mammal Institute (MMI). In a 2007-08 survey, a team led by MMI Director Bruce Mate followed 120 whales within about 10 nautical miles of the shore. “As expected,” they reported, “the migration paths of some gray whales cross through areas of proposed wave energy development.” Studies under way focus on acoustic techniques to help whales avoid wave energy arrays if the facilities are deemed to create problems for the animals in the future. Meanwhile, OSU engineers are testing wave energy devices and working with AXYS Technologies, Inc., of Vancouver, British Columbia, to build a new offshore moored test buoy. A search for an additional test site connected to the nation’s power grid is being led by Sean Moran, NNMREC ocean test facilities manager. To add a new wrinkle to ocean energy, scientists are starting to investigate the potential to capture energy from sea winds. With a U.S. Department of Energy grant, Rob Suryan, a seabird expert at OSU, will lead another NNMREC project to develop remote monitoring technologies that can assess potential wind turbine impacts on seabirds and bats. 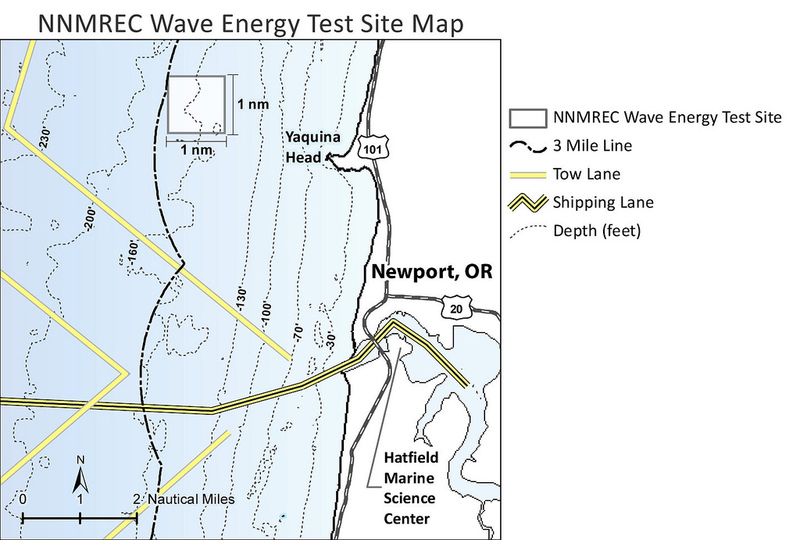 The goal is a thorough analysis of Oregon’s wave energy potential. Engineered systems will need to survive extreme ocean conditions and minimize impact on the environment and traditional ocean uses. “We’ve got the technical side, the environmental side and the outreach to communities through Oregon Sea Grant. You don’t have that everywhere,” says Belinda Batten, director of NNMREC. Plans are to deploy the NNMREC’s test buoy in a site three nautical miles off the coast at Newport in 2012. The moored buoy will allow wave energy developers to place their devices in the ocean and monitor performance. “It can gather all the data we need about the devices: systems performance and power analysis. The developers will go out and moor alongside the buoy and connect through a cable,” says Batten, a mechanical engineer. Companies such as Columbia Power Technologies, Neptune Wave Power and Northwest Wave Energy Innovations have been discussing plans for testing prototypes in Oregon. A fourth company, Ocean Power Technologies, has already received permits for a small commercial-scale device near Reedsport.